The black, white, and green tricolor flag emblazoned with the eight-point red star of Ishtar fluttered amongst the marchers. The flags waved by members of the Iraqi Communist Party (ICP) had previously flown over a period of Iraq that had long been forgotten by the rest of the world. A distant, but positive memory for some Iraqis, the regime of military strongman Abd al-Karim Qasim evokes a period of progressive politics, anti-sectarianism, and an emphasis on Iraqi self-determination. Though the bygone era had been engulfed by the long rule of Saddam and the Iraqi Baathists, the Iraqi Communist Party continues to channel Qasim in modern day Iraq. In Firdus Square, the party stages annual rallies where supporters carry the Qasim regime’s flag along with large portraits of the ruler in order to commemorate the anniversary of the July 14 Revolution. Who was Qasim and how did his coup change Iraq? What lessons can be drawn from the July 14 Revolution today? Returning to the present moment and the May 12, 2018 parliamentary elections have pulled the ICP back into the consciousness of the West. As the United States and Iran watched the electoral success of Sayyid Muqtada al-Sadr and his Sa’eroun alliance, the subsequent formation of a new Iraqi government could see the muting of both nations’ influence. Just as Qasim successfully implemented his military coup in 1958, Sadr in 2018 in a sense has delivered a coup if of his own, only this time at the ballot box. Like Qasim, Sadr promoted an “Iraq first” policy that seeks to put the country above the regional fray and preserve its independence. In the realm of foreign policy, this independence was first seen in March 1959 when Qasim began a friendly relationship with the Soviet Union and allowed for the transfer of Soviet military hardware and advisers, a first for a modern Iraqi leader. Even though his rule lasted just over four years and six months, the lessons and legacy of Qasim’s regime still resonate today, with recent trends of Iraqi nationalism, anti-establishment fervor and anti-corruption undercurrents evidently dominating the political landscape. Sixty years ago, Qasim led the July 14 Revolution, abruptly ending Iraq’s monarchy, removing Iraq from the Baghdad Pact and reorienting Iraq’s foreign policy away from the West. For outside observers, the coup tragically “placed a General on the throne” and by brutally eliminating the monarchy from Iraq’s political sphere permanently transformed the very character of state power in the country. In order to carry-out his coup, Qasim took advantage of the Iraqi army’s deployment near its Western border. Fearing the movement of Syrian troops along their shared border, King Faisal II and Prime Minister Nuri al-Said ordered the army to mobilize for deployment to the frontier. Taking advantage of the security vacuum created by this mobilization, then-General Qasim, together with Colonel Abdul Salam Arif, moved the army’s 3rd Division stationed in eastern Iraq towards the western border in support of Jordan. Passing early in the morning through Baghdad, Qasim suddenly ordered the secret group of Free Officers (formed and inspired by Gamal Abdul Nasser) to seize the radio station, the royal palace, and other key sites in the capital. The Hashemites in neighboring Jordan blasted the coup as the work of foreign powers while BBC radio stations reported that the United Arab Republic was “naturally delighted by news of the Iraq coup.” Successfully taking control of key points in the city of Baghdad, Qasim’s coup in the summer of 1958 ended the thirty seven year reign of the British-backed Hashemites in Baghdad. Unlike the 1941 Golden Square coup of pro-Nazi Rashid Ali al-Gaylani however, the British did not respond to Qasim’s coup by conducting a monarchy restoration invasion. Sixty years later, and the July 14th anniversary of the coup comes at a time when the context of the region has triggered a Qasim-esque resurgence of Iraqi nationalism alongside an intense popular demand for political and economic reform. Despite the temporal difference, the geopolitical situations of these two eras are remarkably similar. The defeat of Da’esh, the re-conquest of the territories held by the Kurds, (including the oil-resources around Kirkuk), each highlight how Iraq is in the process of a tremendous shakeup that recalls the dramatic experience of the Qasim era. Leading up to most recent parliamentary elections, The West widely expected the incumbent Prime Minister Haider al-Abadi to creep across the finish line. Given the lack of alternative options within the Iraqi political landscape, the U.S. had been heavily invested in Abadi’s electoral survival. As the West witnessed Sadr’s Iraqi populism-powered victory, much speculation has been generated about Iraq’s future. 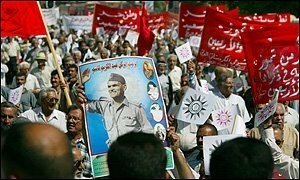 Qasim’s enduring popularity among secular-minded and leftist Iraqis continues to prevail through the decades after the military figure launched a coup and established a benevolent dictatorship. In the Iraqi popular imagination, Qasim continues to be viewed as a patriot who kept Iraq out of the Nasserist and American orbits, as well as a strong leader who stood for the poor and promoted progressive values. Qasim was known for living a simple lifestyle and even slept in the Ministry of Defense building. His land reform efforts, educational, and social policies continue to be examples hailed today by the ICP as a process cut short by the sudden end of Qasim’s regime in 1963. He also placed a noted importance on including women in Iraq’s civil society and promoting gender empowerment through education and political participation. On top of all this, being part Kurdish, his regime promoted an anti-sectarian agenda for the country, a policy that resonates with many Iraqis today. 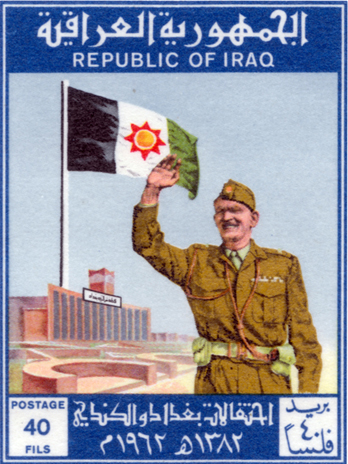 Economically, Qasim was famous for nationalizing the oil sector, significantly scaling back the power of the Anglo-American Iraqi Petroleum Company and creating the Iraq National Oil Company. His government also laid the groundwork for the establishment of OPEC in Baghdad in September 1960. Prior to the 1958 Revolution, the region had already been rocked by several coups. Syria experienced three rapid-fire coups in 1949 alone. The power of Hashemite Iraq had a severe impact on the intrigue and stability of neighboring Syria. 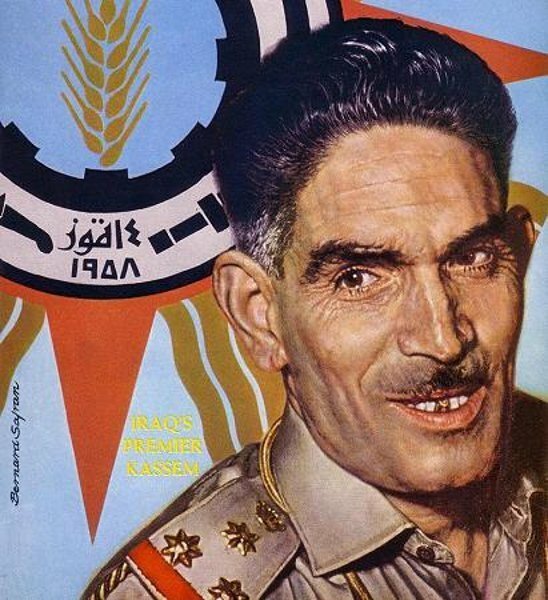 Most interestingly, the second coup in Damascus was led by Colonel Sami Hinnawi, who launched a coup in August 1949, and was accused of seeking a union with Iraq’s Hashemite regime. The so-called Fertile Crescent Plan, although favored by the pro-business People’s Party in Aleppo, was by and large unpopular with mainstream Syrian society due to the British monarchy’s continued backing of Baghdad. Predictably, this resulted in Hinnawi’s overthrow in the final coup in December and the subsequent rise of Adib Shishakli and his four years of military rule. Nearby in Egypt, the July 23 1952 revolution brought Gamal Abdul Nasser and the Free Officers to power, effectively ending yet another Middle Eastern monarchy. Just a few years later, the fall of Shishakli in Damascus and the establishment of the United Arab Republic (UAR) in February 1958 between Syria and Egypt changed the dynamics of the region entirely. To Iraq’s west, Jordan faced its own troubles including Arab nationalist military officer Ali Abu Nuwar and the April riots at the royal army barracks in Zarqa. Once Syria was out of the picture, Nuri Pasha al-Said sought to ward off the Pan-Arabist tide by pre-emptively creating an Arab Federation with Jordan, a move which was struck down after only six months by Qasim’s coup. In Lebanon, the government of Camille Chamoun refused to join the UAR, and when the July 14th coup occurred in Iraq, he turned to the Eisenhower Administration for support against pro-Nasser rebels at home, sparking the 1958 Lebanon Crisis leading to an American intervention against Arab nationalist rebels. The West viewed Qasim’s takeover in Baghdad with great panic. The Suez Crisis was still fresh in the minds of Washington and London, while the Baghdad Pact, a centerpiece of the Cold War’s Middle East anti-Soviet military strategy, was rendered meaningless without Iraq. For the U.S. and the British, the coup was a deep embarrassment and became a source of handwringing. The British, although dismayed, were determined to cut their losses and build a new relationship with Qasim. As long as their economic interests with the Iraqi Petroleum Company were maintained, they were willing to acquiescence to his regime. On the other hand, the Eisenhower Administration viewed the situation as a political fiasco. The long serving head of the Foreign Relations Committee, Democratic Senator James William Fulbright of Arkansas accused CIA chief Allen Dulles of “fumbling in the dark” with the large budget allocated to the agency’s intelligence activities. Within Iraq, Qasim faced his own serious challenges. The veteran nationalist Rashid Ali returned after a long exile in Germany and Saudi Arabia, planning a coup attempt for December 1958, one that ultimately failed and landed him in prison. The impetus for the coup being that Ali differed over Qasim’s wish to avoid an overtly Pan-Arab character in his government, along with the fact that the Qasim regime did not offer the infamous politician a ministry post. Rashid Ali was later pardoned and released into exile, where he lived in Beirut until his death in 1965. However, the Iraqi Nasserites longed to join the UAR and remained unhappy that Qasim’s regime was close with the Communists. These disagreements led to conflict when in March 1959, Arab nationalist army officers revolted in Mosul and clashed with pro-Communist militias. Mosul then became a battleground, culminating in a standoff between the Iraqi army and the rebels that ultimately helped the Qasim regime persevere. Their rebellion had been crushed. Afterwards, the communists helped implement an anti-Arabist purge of the army, a move which further galvanized the Baathists. To aid in survival, Qasim built an alliance with the Kurds. The above picture shows a young Masud Barzani, the future leader of the Iraqi Kurdistan Region (IKR), sitting next to Qasim. 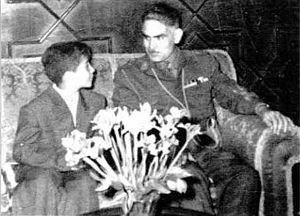 His father, Mustafa, who had earlier taken part in the short-lived Mahabad Republic of 1946, returned from exile to Iraq and formed a friendship, however rocky, with Qasim. Kurdish revolts broke out in 1961 and Qasim strove to achieve stability using both negotiations and military force. For both Qasim and Sadr, the Kurdish region continues to come into play, most recently evidence by Barzani, whose 2017 resignation occurred after spearheading the Kurdish independence referendum. This move dramatically backfired and saw Abadi order the military to retake Kurdish areas, including the oil-rich city of Kirkuk, an offensive that was widely lauded by Arab Iraqis and which prominently featured the Iranian-backed Popular Mobilization Forces (PMF) militias. Kurdish nationals then suffered through a blockade lasting six months. Tension continues to exist, with Baghdad issuing arrest warrants for Kurdish leaders, such as Kirkuk Provincial Council Deputy Chairman Rebwar Fayq Talabani, a decision that was later cancelled. 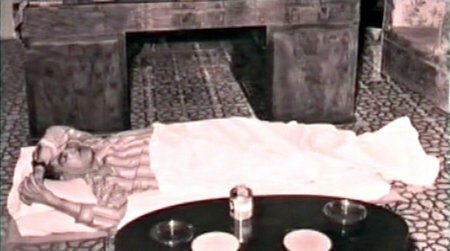 During the Saddam years, state TV also featured a documentary in 1980 called Al-Ayam al-Tawila or The Long Days, which showed Saddam’s failed but heroic ambush on Qasim in Baghdad in October 1959. The incident became a focal point in Saddam’s propaganda and personal lore, a story which led to his exile first to Syria, then on to Cairo. He remained in exile in Egypt before returning to Iraq after Qasim’s downfall. Like Saddam, Qasim championed Iraqi nationalism and expressed support for irredentist claims over Kuwait and Iran’s Khuzestan. The “Ramadan Revolution” coup of February 1963 ended Qasim’s regime. The military figure Ahmad Hasan al-Bakr, forced into retirement for disloyalty, formed an alliance with Sunni tribal sheikhs, middle class Iraqis and Pan-Arabists who had grown tired and resentful of Qasim’s “Iraq First” style of rule. Qasim, in turn, swung further to the political left, seeking out support from the Communists. The Baathist coup plotters recalled staying up drinking whiskey late into the night before they set off for their mission in the morning. As the story goes, one of the member’s mothers held up a Quran, each conspirator walking under it as he departed. In the same vain as Shishakli, Qasim had decided not to arm the communist militia and sought to avoid a civil war. Given these inequalities in weaponry, it is not surprising that he was captured and detained at a radio station. There, he was ordered to confess that the July 14th Revolution was in fact the idea of his co-conspirator, Col. Abdul Salam Arif. Defiantly, Qasim refused and the Baathists denied him the option of exile. They then summarily executed the leader and buried him in an unmarked grave. It is the immortal July 14th. The proud soldier’s great and dazzling leap, embodying the strength of the savior and revolutionary leader who rebelled for the sake of the people, his muscles tense, his fist shattering prison bars in all directions. His body has burst out of the people like an explosion, and the gun-holding hand is reinforced with the people’s hand. It is the dawn of the Revolution which put an end to the annals of tragedy and translated the force of Iraq’s people into constructive energy. The disc above is the sun, light after darkness. It is one of Iraq’s oldest symbols. 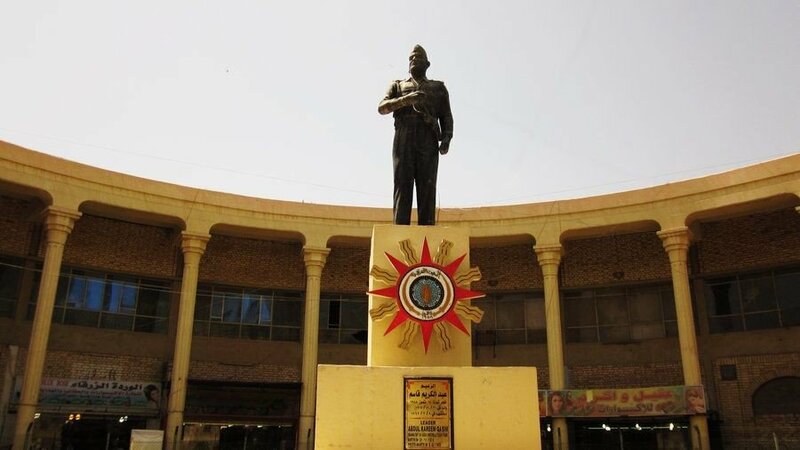 Here [in ancient Mesopotamia] the sun first rose to illumine the world, and here the Revolution’s sun first rose, led by its fearless soldier [Abdul Karim Qasim]. With his foot the soldier has trampled upon a shield representing evil. It is the shield behind which took shelter all reigns of tyranny and corruption. Qasim’s coup in the summer of 1958 is remembered for his revolutionary ethos and vaunted reforms, something that Iraqi political parties will continue to recall. There is also a growing penchant amongst Iraqi youth for the stability and security of past dictatorships. In addition, this summer’s protest movements have illustrated the consistent problems the Iraqi government will endure. Like a resurrected Ozymandias, the short reign of Abdul al-Karim Qasim and his benevolent dictatorship serve as a blueprint for social justice in today’s Iraq. In the wake of Iraq’s 2018 elections, the era of Qasim yields vital lessons for modern Iraq, concerning the delicate balance of military and political power in Baghdad at this critical juncture in the nation’s history.